The Sayings of Jesus on the cross (sometimes called the Seven Last Words from the Cross) are seven expressions biblically attributed to Jesus during his crucifixion. Traditionally, the brief sayings have been called "words". They are gathered from the four Canonical Gospels. Three of the sayings appear only in the Gospel of Luke and three only in the Gospel of John. The other saying appears both in the Gospel of Matthew and the Gospel of Mark. In Matthew and Mark, Jesus cries out to God. In Luke, he forgives his killers, reassures the penitent thief, and commends his spirit to the Father. In John, he speaks to his mother, says he thirsts, and declares the end of his earthly life. A person's final articulated words said prior to death or as death approaches generally are taken to have particular significance. These seven sayings, being "last words", may provide a way to understand what was ultimately important to this man who was dying on the cross. The sparsity of sayings recorded in the biblical accounts suggests that Jesus remained relatively silent for the hours he hung there. Since the 16th century they have been widely used in sermons on Good Friday, and entire books have been written on theological analysis of them. The Seven Last Words from the Cross are an integral part of the liturgy in the Anglican, Catholic, Protestant, and other Christian traditions. The seven-sayings tradition is an example of the Christian approach to the construction of a Gospel harmony in which material from different Gospels is combined, producing an account that goes beyond each Gospel. Several composers have set the sayings to music. 1.4 4. My God, my God, why have you forsaken me? Luke 23:34: Father, forgive them, for they know not what they do. Luke 23:43: Truly, I say to you, today you will be with me in paradise. Matthew 27:46 & Mark 15:34 My God, My God, why have you forsaken me? Luke 23:46: Father, into thy hands I commit my spirit. Traditionally, these seven sayings are called words of 1. Forgiveness, 2. Salvation, 3. Relationship, 4. Abandonment, 5. Distress, 6. Triumph and 7. Reunion. Then Jesus said, "Father, forgive them, for they do not know what they are doing." This first saying of Jesus on the cross is traditionally called "The Word of Forgiveness". It is theologically interpreted as Jesus' prayer for forgiveness for the Roman soldiers who were crucifying him and all others who were involved in his crucifixion. Some early manuscripts do not include this sentence in Luke 23:34. And he said to him, "Truly, I say to you, today you will be with me in paradise". This saying is traditionally called "The Word of Salvation". According to Luke's Gospel, Jesus was crucified between two thieves (traditionally named Dismas and Gestas), one of whom supports Jesus' innocence and asks him to remember him when he comes into his kingdom. Jesus replies, "Truly, I say to you..." (ἀμήν λέγω σοί, amēn legō soi), followed with the only appearance of the word "Paradise" in the Gospels (παραδείσω, paradeisō, from the Persian pairidaeza "paradise garden"). A seemingly simple change in punctuation in this saying has been the subject of doctrinal differences among Christian groups, given the lack of punctuation in the original Greek texts. Catholics and most Protestant Christians usually use a version which reads "today you will be with me in Paradise". This reading assumes a direct voyage to Heaven and has no implications of purgatory. On the other hand, some Protestants who believe in soul sleep have used a reading which emphasizes "I say to you today", leaving open the possibility that the statement was made today, but arrival in Heaven may be later. Crucifixion depicted as Stabat Mater with the Virgin Mary, Porto Alegre, Brasil, 19th century. Jesus saw his own mother, and the disciple standing near whom he loved, he said to his mother, "Woman, behold your son". Then he said to the disciple, "Behold your mother". And from that hour, he took his mother into his family. This statement is traditionally called "The Word of Relationship" and in it Jesus entrusts Mary, his mother, into the care of "the disciple whom Jesus loved". 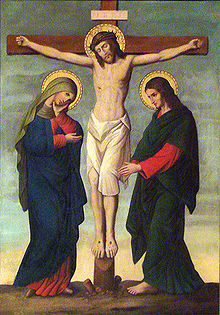 Methodist minister Adam Hamilton's 2009 interpretation: "Jesus looked down from the cross to see his mother standing nearby. As far as we know, only one of the twelve apostles was there at the foot of the cross: "the disciple whom Jesus loved," usually identified as John. Naked and in horrible pain, he thought not of himself but was concerned for the well-being of his mother after his death. This shows Jesus' humanity and the depth of love he had for his mother and the disciple into whose care he entrusted her." 4. My God, my God, why have you forsaken me? "My God, My God, Why Hast Thou Forsaken Me?" redirects here. For the film, see My God, My God, Why Hast Thou Forsaken Me? (film). Around the ninth hour, Jesus shouted in a loud voice, saying "Eli Eli lama sabachthani?" which is, "My God, my God, why have you forsaken me?" And at the ninth hour, Jesus shouted in a loud voice, "Eloi Eloi lama sabachthani?" which is translated, "My God, my God, why have you forsaken me?" It is the only saying that appears in more than one Gospel, and is a quote from Psalm 22:2. This saying is taken by some as an abandonment of the Son by the Father. Other theologians understand the cry as that of one who was truly human and who felt forsaken. Put to death by his foes, very largely deserted by his friends, he may have felt also deserted by God. Others point to this as the first words of Psalm 22 and suggest that Jesus recited these words, perhaps even the whole psalm, "that he might show himself to be the very Being to whom the words refer; so that the Jewish scribes and people might examine and see the cause why he would not descend from the cross; namely, because this very psalm showed that it was appointed that he should suffer these things." Theologian Frank Stagg points to what he calls "a mystery of Jesus' incarnation: "...he who died at Golgotha (Calvary) is one with the Father, that God was in Christ, and that at the same time he cried out to the Father". In Aramaic, the phrase was/is rendered, "אלי אלי למה שבקתני". While "the nails in the wrists are putting pressure on the large median nerve, and the severely damaged nerve causes excruciating pain", the Lamb of God experiences the abandonment of the soul by God, a deeply excruciating pain that "is the essence of eternal condemnation in Hell". This statement is traditionally called "The Word of Distress" and is compared and contrasted with the encounter of Jesus with the Samaritan Woman at the Well in John 4:4-26. As in the other accounts, the Gospel of John says Jesus was offered a drink of sour wine, adding that this person placed a sponge dipped in wine on a hyssop branch and held it to Jesus' lips. Hyssop branches had figured significantly in the Old Testament and in the Book of Hebrews. This statement of Jesus is interpreted by John as fulfilment of the prophecy given in Psalm 69:21 (cf. Psalm 22:15), hence the quotation from John's Gospel includes the comment "to fulfill the scriptures". Jesus said, "It is finished". This statement is traditionally called "The Word of Triumph" and is theologically interpreted as the announcement of the end of the earthly life of Jesus, in anticipation for the Resurrection. The verse has also been translated as "It is consummated." And speaking in a loud voice, Jesus said, "Father, into your hands I commend my spirit". From Psalm 31:5, this saying, which is an announcement and not a request, is traditionally called "The Word of Reunion" and is theologically interpreted as the proclamation of Jesus joining God the Father in Heaven. Hamilton has written that "When darkness seem to prevail in life, it takes faith even to talk to God, even if it is to complain to him. These last words of Jesus from the cross show his absolute trust in God: 'Father, into your hands I commend my spirit'. This has been termed a model of prayer for everyone when afraid, sick, or facing one's own death. It says in effect:"
The last words of Jesus have been the subject of a wide range of Christian teachings and sermons, and a number of authors have written books specifically devoted to the last sayings of Christ. Priest and author Timothy Radcliffe states that in the Bible, seven is the number of perfection, and he views the seven last words as God's completion of the circle of creation and performs analysis of the structure of the seven last words to obtain further insight. The saying "My God, my God, why have you forsaken me" is generally given in transliterated Aramaic with a translation (originally in Greek) after it. This phrase is the opening line of Psalm 22, a psalm about persecution, the mercy and salvation of God. It was common for people at this time to reference songs by quoting their first lines. In the verses immediately following this saying, in both Gospels, the onlookers who hear Jesus' cry understand him to be calling for help from Elijah (Eliyyâ). The slight differences between the two gospel accounts are most probably due to dialect. Matthew's version seems to have been more influenced by Hebrew, whereas Mark's is perhaps more colloquial. The Aramaic word šabaqtanî is based on the verb šabaq, 'to allow, to permit, to forgive, and to forsake', with the perfect tense ending -t (2nd person singular: 'you'), and the object suffix -anî (1st person singular: 'me'). A. T. Robertson noted that the "so-called Gospel of Peter 1.5 preserves this saying in a Docetic (Cerinthian) form: 'My power, my power, thou hast forsaken me!'" James Dunn considers the seven sayings weakly rooted in tradition and sees them as a part of the elaborations in the diverse retellings of Jesus' final hours. Dunn, however, argues in favour of the authenticity of the Mark/Matthew saying in that by presenting Jesus as seeing himself 'forsaken' it would have been an embarrassment to the early Church, and hence would not have been invented. 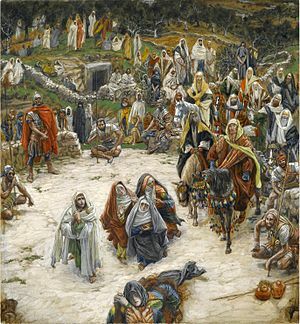 Geza Vermes, states that the first saying from (Matthew and Mark) is a quotation from Psalm 22, and is therefore occasionally seen as a theological and literary device employed by the writers. According to Vermes, attempts to interpret the expression as a hopeful reference to scripture provide indirect evidence of its authenticity. Leslie Houlden, on the other hand, states that Luke may have deliberately excluded the Matthew/Mark saying from his Gospel because it did not fit in the model of Jesus he was presenting. ^ Richard Young (Feb 25, 2005). Echoes from Calvary: meditations on Franz Joseph Haydn's The seven last words of Christ, Volume 1. Rowman & Littlefield. ISBN 9780742543843. Retrieved 1 April 2012. Interestingly, the Methodist Book of Worship adopted by the General Conference of 1964 presented two services for Good Friday: a Three Hours' Service for the afternoon and a Good Friday evening service that includes the "Adoration at the Cross" (the Gospel, Deprecations, and Adoration of the Cross) but omits a communion service, which would be the Methodist equivalent of the Mass of the Presanctified. ^ The Encyclopædia Americana: a library of universal knowledge, Volume 13. Encyclopedia Americana. 1919. Retrieved 1 April 2012. The 'Three Hours' Devotion, borrowed from Roman usage, with meditation on the 'seven last words' from the Cross, and held from 12 till 3, when our Lord hung on the Cross, is a service of Good Friday that meets with increasing acceptance among the Anglicans. ^ "Seven words from the cross (reflection)". Ukrainian Orthodox Greek-Catholic Church. Feb 28, 2011. Archived from the original on Aug 13, 2018. ^ "John 19:30". Douay-Rheims Bible. Jesus therefore, when he had taken the vinegar, said: It is consummated. And bowing his head, he gave up the ghost. ^ Robertson's Word Pictures of the New Testament (Broadman-Holman, 1973), vol. 1. ISBN 0-8054-1307-3. ^ a b James G. D. Dunn, Jesus Remembered, Eerdmans, 2003, pp. 779–781. ^ Geza Vermes, The Passion, Penguin 2005, p. 75. ^ Vermes, Géza. The authentic gospel of Jesus. London, Penguin Books. 2004. This page was last edited on 20 April 2019, at 10:37 (UTC).